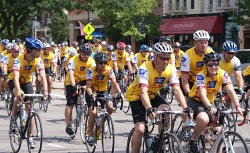 The charity bike tour has provided the motivation for many new cyclists to become interested in the sport. They've also become favorites for veteran riders, providing an annual event to look forward to, get together with long-time cycling friends, and re-live old memories. The following 5 tips will help you get ready for your event, and help you enjoy yourself more during the event. Many of these events, like the MS150 Pedal to the Point, Pan Ohio Hope Ride, and Pelotonia are multi-day rides, but most of these tips apply equally well to single-day events such as the Tour de Cure, or to non-charity events such as the Great Ohio Bicycle Adventure (GOBA). Train by building up your mileage gradually. Most supported bike tours have rest stops every 12 to 15 miles, so if you can ride that distance comfortably, you'll do fine. If you're a beginning rider, start your training by doing short loops of 12-15 miles from your home or on your favorite local bike trail. Once you've done that a few times, ride out 12-15 miles, take a break, then ride back. Later, ride out 30 miles, then ride back, taking a couple of short breaks along the way. Keep building up your distance in this manner until you get to the distance of your event. During your breaks, eat a light snack. Drink plenty of water or sports drink during the breaks and while you're riding. To avoid "bonking" or dehydration, you should follow the rule of "drink before you're thirsty; eat before you're hungry." In summer-like weather, you should finish at least one water bottle between each rest stop, if not more. Don't spend too much time dawdling at the rest stops. If you rest too long, you're body thinks it's done for the day, and then you'll have to warm up all over again when you get back on the bike. Make sure your bicycle is tuned up and in good working order. Don't wait until the week before your event to take your bike into your favorite shop for a tune-up, because during the busy season, the service department may be backed up longer than a week. It's okay to take it in a month or so before the event--once it's tuned up, nothing major should go wrong with it in a couple of weeks, and the shop that tuned it up should be glad to give it a last-minute safety check a couple of days before the event. Don't rely on the event support mechanics for a tune-up or other major work--they are there to help you with unexpected emergencies, but they are not likely to have a lot of hard-to-find parts on hand, especially if you've got exotic wheels or other high-end components. When choosing what gear to pack, find a good balance between comfort and convenience. Self-supported bike tourers are like backpackers; they are constantly weighing each piece of gear they use and trying to find the lightest possible items to carry. This often means sacrificing comfort, such as sawing the handle off of your toothbrush, using the smallest, thinnest sleeping pad, and a tent that you barely have room in which to change your clothes. On a supported tour, however, you have the luxury of somebody carrying your gear for you, so you can afford to live it up a little. If you're traveling alone, use a spacious 2-person tent. If you're traveling with a partner, use a 3- or 4-person tent so you're not rolling over each other all night. Use a nice, thick model of sleeping pad, or even an inflatable mattress. If you're a light sleeper, bring along ear plugs and an eye shade to minimize disturbances from the campers around you. Bring a small flashlight or headlamp for those late-night excursions to the restroom. Don't go too overboard with this tip! You'll need far less clothing than you think. You'll be wearing your casual off-the-bike clothes for only a few hours each day, so you can probably double up on the days you wear each t-shirt and pair of shorts. You should only need one sweatshirt or light jacket for the evenings when it cools off. And keep in mind the generous volunteers that will be loading and unloading your bags every day! Stay within the tour organizer's stated limits for the number, size, and weight of each of your checked bags. If you're riding with a partner, put your shared camping gear in one bag, and combine your clothing in a second bag. Or, pack your personal items and clothing in separate bags, and split up the shared gear between you. Don't forget to have fun! You've spent months training, and raising funds and awareness for your cause. The ride is your reward for all of the hard work you've put in. Enjoy it however you wish! Ride at whatever pace is comfortable for you. Stop at the rest stops and partake in the snacks and socializing. Smell the roses, as the saying goes. If you end up feeling like you're having a bad day, or if the weather turns sour, don't feel guilty if you have to hitch a ride in the SAG wagon. Forcing yourself to suffer through a ride does not do anything to relieve the suffering of the people you're riding for. Stay safe! Be a good ambassador for cycling. Always be aware that non-cyclists will judge your actions, and then judge every other cyclist based on those actions. This may not be fair, but it's a fact of life. By behaving as an upstanding bicycling citizen at all times, you'll make riding safer and more enjoyable for yourself and the rest of us. Don't assume that because you're riding for a charity that you're above the law. Obey the usual traffic regulations just like drivers are expected to do. Even though Ohio law allows riding two abreast, if a driver is trying to pass you, single up for a moment to make it easier. Don't pass drivers on the right at stop signs or traffic lights; get in back of the line and wait your turn. The Century Cycles staff has many years of combined experience in bike tours, both as participants, and through our sponsorship and support of many of Ohio's most popular rides. Look for our support van this summer at the Great Ohio Bicycle Adventure, Ice Cream Odyssey, Pan Ohio Hope Ride, MS150 Pedal to the Point, and the NEW Farm 'N Barn Bike Tour in the Cuyahoga Valley! What tips do you have to share from your cycling adventures? Share your thoughts by leaving a comment below. Great tips! I just finished the Tour de Cure last Sunday and your Rocky River staff was instrumental in preparing my bike as well as myself for the 62 mile "sorta hilly" ride. Kudos to you all! Training for Pedal to the Point now. I'll be back for more GU and whatever other components I need.